This letter is to inform you on the procedure to install a printer port in your pinball game. 1. Inventory physical parts against the parts list above.� Please contact your local CAPCOM Distributor regarding any missing or damaged parts. 5. Locate the key to the backbox.� Insert the key into the lock at the top of the backbox and turn it fully clockwise.� Lift up on the backglass and swing it out towards the front of the game.� Carefully remove the backglass and set it aside in a safe place. 6. Open the dot matrix display panel by pushing the two latches, located above the speaker enclosures, out towards the sides of the backbox. Now lower the display panel. 7. Connect the serial data cable (C-00197) to connector J3 on the CPU PCB. 8. Route the cable around the CPU board dressing the cable to existing cable with 2 cable ties at the corners of the CPU PCB and cable clamps. 11. Raise the playfield to its� vertical position. 12. Run the cable along the inside left wall until it reaches the coin door.� Make sure that the cable will not be pinched in the backbox.� Use wire ties to secure the cable approximately every 6�. 13. 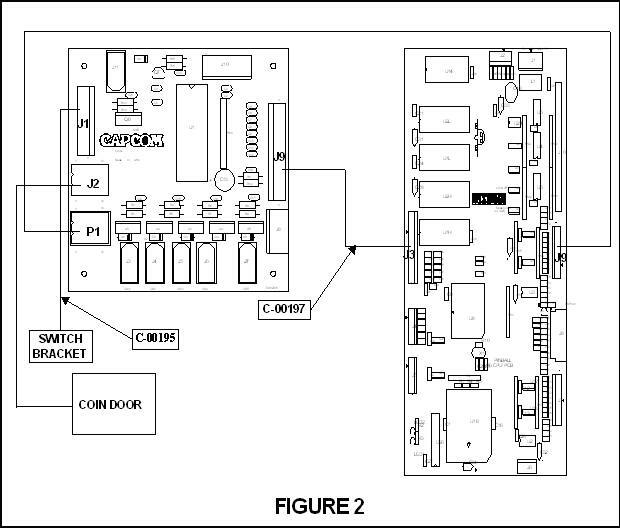 Attach the RS232/coin meter/printer PCB (with the screws, SC00121-08, and spacers, PL00108-04, provided) to the inside left wall.� Refer to figure 1 for the proper location. 14. Connect the serial data cable (the other end was just connected to the CPU in STEP 7) to connector J9 on the RS232 PCB.� Refer to FIGURE 2 for proper wiring connections. 15. Trace the wiring from the coin door back into the cabinet to a Molex connector. 16. Separate the connector into its� respective halves.� Now connect the male connector to the female connector (P1) on the RS232 PCB and the female connector to the male connector (J2) also on the RS232 PCB.� Refer to FIGURE 2 for proper wiring connections. 17. Connect the printer interface cable, C00195, to J1 on the RS232 PCB.� Mount the other end of the cable, which has a DB9 type connector, in the slot in the switch bracket with the supplied mounting hardware.� Refer FIGURE 2 for proper wiring connections. 18. Lower the playfield and reinstall the backglass, playfield glass, and glass holddown.� Make sure the backglass is locked and secured.